Discus is arguably one of the most famous and well-liked freshwater tropical fish highly sought after by all hobbyists. At of point, not long after their initial introduction sometime around the late 80’s when the first wild caught discus were introduced to the fish keeping community and made their way to the home aquarium tank, the whole thing actually generated a lot of buzz until people do not have doubt about paying few thousand dollars just to acquire a fine specimen. In fact until today, they were considered to be the type of fish that belongs to the elite and exotic group and maintains this status as more and more colorful variants were introduced. They are appreciated not only because of their nice well-defined shades and unique patterns but also due their graceful movements that swim slowly in the tank and all these will never fail to catch the attention of aquarist. Most noticeable appearance which makes them so easy to identify compared to the other fish is their shape whereby there is no other fish species in the world that shares the same feature and characteristics. They are also considered one of the highly sought after aquarium community fish as they will get along fine not only with the other Amazonian species but also with some other non-native fish as well. Most hobbyists that I’ve known loved them and at one time or another have kept them before as pets. And even though with their demanding nature that could easily frustrate most people, this doesn’t stop hobbyist from giving up their venture and until today still maintains wide interest in having the fish. Keeping discus as pets in the home aquarium tank can be very demanding and often challenging because they are not considered as the type of fish that allows mistakes to be made. In other words, they demand perfection, and that is in terms of water quality, foods and living environment. With the fussy requirements, this could easily frustrate most people but once you have grasped the basic understanding about the fish, things might not be as bad as it seems. Let’s look at all the factors involved and how we can effectively deal with them as an aquarist. Discus fish are known to have the least tolerance when it comes to high ammonia and nitrite levels. While some other fish species can live in partially cycled tank having water quality with nitrite measuring up to 0.5ppm, putting discus into the same water condition could easily spell disaster as prolonged exposure will cause them to exhibit clamped fins, blurred out body color, remain idle stationary at same spot with front head tilting down and also total loss of appetites. Thus, what all these mean is that you can only put them in after the water condition has already stabilized with ammonia at zero (no compromise on this critical parameter) and nitrite level lower than 0.3ppm. While high nitrate can have less detrimental effect and with some discus breed showing more tolerance, it is still recommended to keep this parameter as low as possible, preferably below 5ppm. In order to achieve this, strict rule of thumb is only to add in your discus after the aquarium has fully undergone the final stage of the nitrogen cycle and at least 2 days prior to adding your fish, do a last and final confirmation check on all the water parameters to make sure that everything is okay. You might be asking yourself on whether it is necessary to take such an extreme and over-sensitive precaution, the question is best left for yourself to answer. After all, this pet doesn’t come cheap as a mature discus pair can easily fetch few thousands for the high quality exotic breeds. Temperature and pH are the next two most important water parameters to watch out. While most hobbyists prefer maintaining close to neutral pH, some desirable effects are actually seen when the shift is slightly towards more acidic around 6.5 to 6.8 which is the condition most favorable to them. 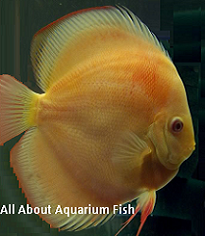 Certain aquarist might have different opinions as some prefer going as low as 6.2 but that is not really necessary as most (almost 99%) of the discus fish available today seen in pet shops and home aquariums are all domestic bred in fish tanks. For water temperature, in the past when the first wild caught discus fish were kept in tanks, they require at least 32degC in order to survive. During that period, aquarist has to incur high maintenance cost as they need to use heater all the time to maintain the right temperature and because of this requirement, a lot of people had been complaining about how hard it is to care for them. Certain people who can't afford a heater have to resort to having a lamp lit under the tank but all these were things in the past. The modern day discus that you see today is already highly adaptive to our natural living environment and room temperature condition but their tolerance limit is only as low as 27degC and preferably not lower than that. Else water temperature that is too low will increase their susceptibility to different types of disease and your fish will end up sick all the time. Thus, extreme care has to be taken to constantly monitor the temperature so that it doesn’t drop below the range and if possible, create a buffering capacity in order to maintain the right pH as well. Discus although are not picky or fussy when it comes to the type of foods that they get, malnourished condition lacking in certain nutrients might not bode well for them. Discus although can survive fully on being fed just only on pellets and dried processed fish foods, but however, in long term, it can experience slower than normal growth rate, blurred out colors and generally sterile. The best nutrition for your pet fish should be live foods such as bloodworms, earthworms, grind meat like beef and even market prawns. Never use tubifex worms which are naturally found in contaminated drains and water source because you will risk introducing unwanted disease which will make conditions even worse. Having said all that, even though you are feeding market prawns, make sure that those are properly washed and cleaned and the best follow up actions after your fish has completed its meal, is to quickly conduct 10% water change to siphon out whatever leftover waste. This is absolutely necessary because if those bits and pieces of foods get left around, stuck in the corners, it will start to rot and present a good chance for the bacteria to proliferate. Thus, there are aquarium owners who advocate keeping the tank bare bottom in order to make water changes easier and their focus is mainly on the discus fish itself and everything else like tank decorations are not important. Foods given to your pet discus should also vary. Never stick to only one type of food for long period of time but instead vary and rotate around the different types so that they get constant supply of protein and every nutrient that they require. Fish fed with quality meals will also show better resistance to disease and they are able to withstand water temperature fluctuation much better, hence they don’t fall sick that often. Also with nutritious feed, this will most likely induce spawning and the fry will be of better quality. Discus fish if well fed, will display extremely fast growth rate often achieving full-grown adult size of 8 inches in just 9 months starting from a small few millimetres fry. As mentioned earlier, sometimes less is better and that is definitely true when it comes to discus care. Barren tank will result in easier-to-handle water change and without bogwood or gravel which has the potential to rot and leach unwanted chemicals to the water; overall this will make things much simpler to manage. Tank placement for your discus should also be at location exposed to brief period of sunlight for at least an hour (but not too long over 2 hours as it can encourage algae growth) so that they fish gets the natural light exposure which helps them to stay healthy and maintain their natural colors. Also with slightly greenish water which results from the brief exposure, this will also help your pets to acclimatize to the environment much better especially right after the water change. Discus are also known to be sensitive to glaring lights and sudden unanticipated movements around their tank (especially with people walking around), thus make sure both the left and right sides of the aquarium is painted dark color to avoid reflection. This is extremely important for them to develop the sense of security in their home. Some aquarists recommend adding live aquarium plants especially those with thick leaves but I find that not necessary. Previously I had two separate tanks one acting as display aquarium with plants in it while another one which houses the siblings from the same parents, has totally nothing at all in the aquarium. Months progressed and those in the second tank which is barren actually achieve the same growth rate compared with their siblings in a tank with plants and thus, my conclusion is that barren setup is as good as the planted ones. There are some people who insist on having some decorations as they feel that fishkeeping means nothing without the accessories and display ornaments around but that is totally different story altogether and certainly, the choice is yours to decide.